Editor's note: Brian Michael Jenkins is senior adviser to the RAND president and the author of Al Qaeda in Its Third Decade: Irreversible Decline or Imminent Victory? and the commentary 'Generations of Terrorism.' The views expressed are his own. As officials in the West sift through the evidence to try to establish how exactly Malaysian Airlines Flight MH17 was downed in eastern Ukraine, it is easy to forget that only a couple of weeks ago, many analysts were focused on a quite different threat to civilian aircraft. Earlier this month, the U.S. Transportation Safety Administration grabbed headlines when it announced that uncharged cellphones would not be allowed aboard commercial aircraft as part of increased U.S. scrutiny of cellphones and other electronic devices on certain U.S.-bound flights. The move came in response to intelligence that terrorist groups in Yemen and Syria might be plotting new attempts to sabotage airliners. The reason for the concern about devices that don't function seems obvious: TSA inspectors hope to make sure cellphones are cellphones and laptops are indeed laptops – and that neither are cleverly disguised bombs. After all, terrorists have a long history of seeking to conceal explosives aboard aircraft, and using electronic devices as camouflage is nothing new. So why the concern now? Extending the functionality check to cellphones indicates concern among officials that terrorists are making strides in their quest to hide explosives in ever smaller and more innocuous-looking places. Regardless, the intelligence behind the new security measures represents a conflation of two threat streams – a continuing campaign by al Qaeda's affiliate in Yemen to sabotage airliners, and a growing population of Westerners joining jihadist groups in Syria who may be recruited to carry out suicide missions. The reality is that despite the numerous other targets available, terrorist groups seem obsessed with attacking commercial aviation even though improvements in passenger screening, locked armored cockpit doors, and the response of desperate passengers make hijacking a less viable terrorist tactic – it would be harder today, although not necessarily impossible, to carry out another 9/11. The terrorist focus since 9/11 has, therefore, been on smuggling bombs aboard airliners. This is, of course, not a new tactic, instead dating back to 1970, when a bomb planted by Palestinian terrorists brought down a Swissair flight bound for Tel Aviv, killing 47 people on board. But even this wasn't the first example of the sabotaging of a commercial airliner. That occurred in 1933 when a bomb destroyed a commercial airliner flying between Cleveland and Chicago. The perpetrator and motive were never identified. Since 9/11, terrorists have plotted to smuggle bombs on board airliners on at least nine occasions, including the failed attempts by the shoe bomber in 2001 and the underwear bomber in 2009. Though much bigger than a cellphone, computer printer cartridges were used by terrorists to disguise bombs in a 2010 plot that was detected by authorities and neutralized. Bombs concealed in electronic devices are nothing new. The Popular Front for the Liberation of Palestine-General Command concealed explosive devices in radios, and it was believed that a similar device brought down PanAm flight 103 in 1988. Nor are cellphone bombs new. Israeli intelligence embedded an explosive device in a cellphone likely to be used by the chief bomb maker for Hamas in 1996. When they confirmed that he was on the telephone, they remotely detonated the device killing him instantly. The fact is that in most of the known bombing attempts since 9/11, terrorists actually succeeded in getting their bombs on airplanes. But in order to do so, they had to build smaller devices without using metal parts or explosive substances that might be detected. That creates reliability problems. Cellphones weigh about 4 ounces; their batteries weigh about an ounce or so. That doesn't give a terrorist bomb maker much room to plant explosives in a working cellphone. Sabotaging an airliner requires more explosives than killing somebody with a tiny quantity of explosives next to their ear. The device carried by the shoe bomber had 10 ounces of explosives, while that worn by the underwear bomber had only 2.6 ounces, probably not enough to bring down a plane. And while placing explosives inside a cellphone is plausible, it is almost impossible to do so with iPhones without rendering them non-functional, which is why the TSA is now checking cell phones are actually working. Of course, fears of growing sophistication in terrorists' methods is only part of the problem, and may not in itself have been enough to trigger the latest warnings. But with hundreds of young men from Europe, the United States, and other Western countries joining jihadist groups in Syria and now possibly Iraq, Western intelligence agencies are now confronted by potential terrorists who, unlike known, more established members of the jihadist front, are much less likely to appear on no-fly lists. Indeed, at least one American volunteer already made it to Syria to carry out a suicide bombing there. Significant strides have been made in airline security. But terrorists have also made strides in constructing explosive devices and concealing them in ways that require increasingly intrusive searches. As this latest alert demonstrates, this deadly race continues. NRA demands TSA allow small guns to defend against small knives. Ok...but WHAT does NSA say about all this? Depends how close of a working relationship NSA has with NRA. And if they had their say it would be MYOB. Of course, this just MHO. Lmao im almost afraid to ask....ok ill take the plunge...what is MYOB and MHO? MHO – My (ever so, because you know I am) Humble Opinion. Lololol @ bobcat i woulda never guessed. And i think it would be safe to say that NSA would never subscribe to the MYOB chain of thought. As American travelers as we pack those suitcases and take our son or daughters on that first family vacation in the hot summer months, to visit the most wonderful place on earth Disneyland or to watch the sunset in the Grand Canyon in our great nation. 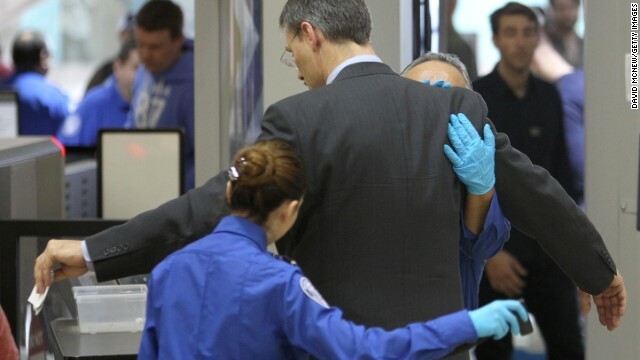 When we stand in those long lines at the airport TSA customs lines to board the airplanes, we all groan at the fact at another airport security measure from turning our cellphone's and computers on and off to prevent another terrorist attack on American soil. Instead of groaning and moaning as American travelers about the NSA, TSA and Homeland Security who create these airplane security rules, we should thank these brave men and women who put their lives on the line to prevent the next 9/11 terrorist attack in American airports and to protect our freedoms at all costs for American travelers. As American travelers like myself we enjoy the fact of packing a suitcase and planning those great summer getaway's to the warm beach's of San Diego and Miami, also going to see a great theater play in New York City with our friends and taking those vacation experiences, back home to our family's who can plan their next vacations to those city's we have visited in our great nation. Without TSA creating more airport safety security rules for American travelers, will we ever stay one step ahead of the latest terrorists attacks or will we as Americans see continuous threats on our way of life from terrorism groups who hate American freedom and liberty for years to come.